Common Name: Velvet Leaf, Abuta, Pereira Root, Barbasco. Part Used: Whole Vine, Seed, Bark, Leaf, Root. Habitat: Found in tropical region of india. In order to meet excellent quality standards, we are supplying Cissampelos Pareira. Abuta is a tropical woody, climbing vine (liana) with long leaves, white flowers and inedible dark, grape sized, 3/4" long, berries. It is indigenous to the Amazon rain forest but also grows abundantly in India. It resembles a ruffled ribbon, winding its way up to the top of the tree. The stem is deeply furrowed, Grey, and covered with patches of lichen. We are amongst the most reputed names in the industry, offering Cissampelos Pareira. Patha – Cissampelos pareira is an Ayurvedic herb, used mainly in the treatment of fever, intestinal worms, non healing wounds etc. 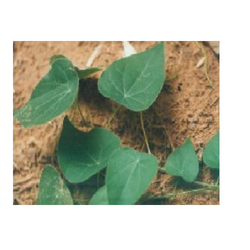 Another herb – Cyclea peltata is also used in the name of Patha. Note : We are also dealing in various form (Powder, liquid , semi- liquid ) extract. Our reputed entity is engaged in supplying Cissampelos Pareira. Cissampelos Pareira Plant belongs to Menispermaceae family. The plant has various therapeutic and medicinal uses. Cissampelos pareira is commonly known as the midwives herb due to its long history of use in South America for women's ailments. Found widely in India, Ceylon, and other countries, it contains berberine, and isoquinone alkaloids.